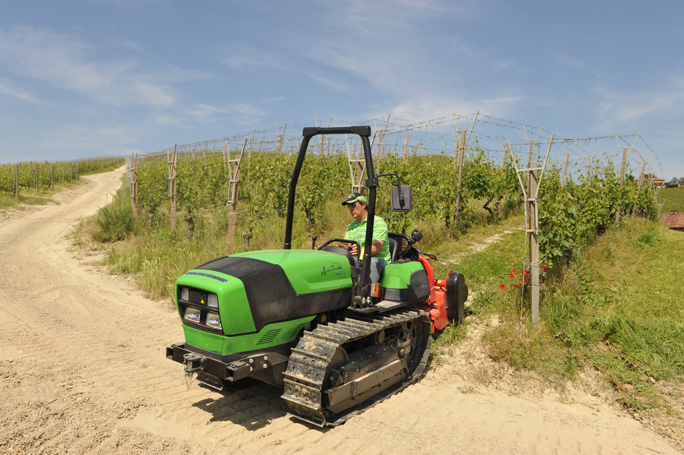 With the Agroclimber V and F series, the DEUTZ-FAHR range of crawlers caters for an even broader spectrum of applications than ever: from jobs in the open field to a wide variety of specialist applications, especially in fruit orchards (400FI410F) and vineyards (310V). 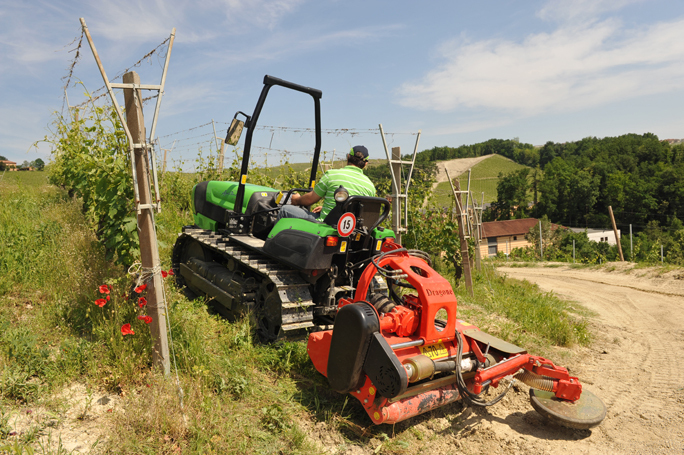 The main differences between the Agroclimber V and F series are dimensions and power: F models have a compact, sturdy structure designed for working between rows, and are available with a minimum width of 1.36 m and rated power outputs of 90 or 100 hp; while V models are even more specialised, and are extremely agile even in very restricted conditions, with a minimum width of 1.18 m and an engine power of 80 hp. Power and superior automation from an unbeatable engine. 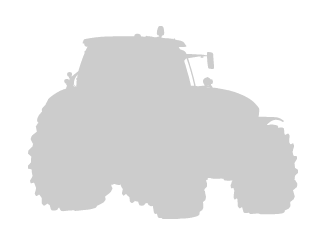 Agroclimber F/V crawlers are equipped with three or four cylinder Euro III turbo-intercooler engines. 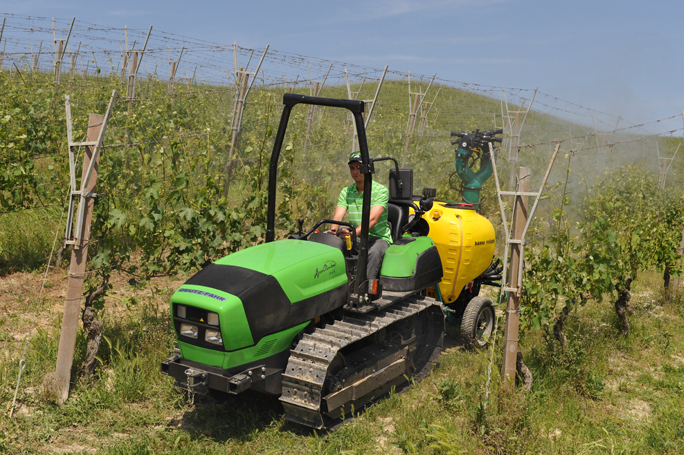 The Agroclimber 400FI410F is powered by a 4,000 cc (4.0 litre) engine, while the Agroclimber 310V features a 3,000 cc (3.0 litre) unit. Agroclimber engines are fed by a single high pressure injection pump, for optimum fuel atomisation and progressive, efficient combustion, while the advanced SDF system (with individual pumps for each cylinder) ensures instantaneous injection times, with the injection cycle itself managed electronically in relation to load for improved fuel economy. These engines feature an electronic governor, making the driver's job simpler and quicker and increasing productivity: the driver can set and store engine speed presets for specific applications and recall them whenever needed. Once recalled, the system maintains the engine speed preset at a constant value. Smooth speed control, even with tracks. DEUTZ-FAHR's chief goal in developing the transmissions for the 400FI410F and 310V was to create a specifically optimised gearbox for each model, to offer crawlers that drive with superlative smoothness and deliver impressive productivity, even when working under very heavy strain. Agroclimber V models have a manual gearbox with eight FWD/REV gears (or twelve, as an option), while Agroclimber F models are equipped with a mechanical gearbox with underdrive and supercreeper gear, for a total of sixteen FWD/REV speeds. Power is everything for a crawler. 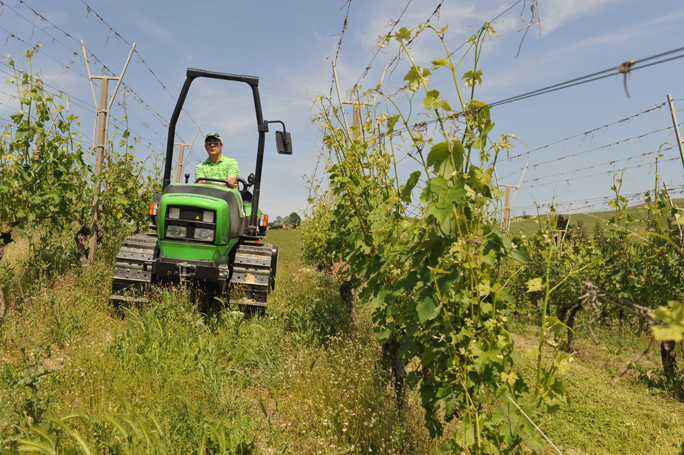 Agroclimber F models are offered with a two-speed (540/540ECO rpm) electrohydraulically engaged PTO; while Agroclimber V models come with a two-speed (540/1000 rpm) mechanically engaged with a lever. Versatile hydraulics for absolute reliability. 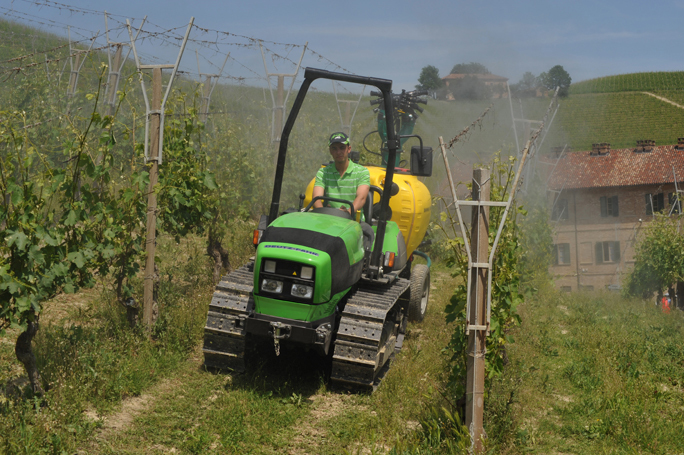 Agroclimber models are equipped with a generously sized hydraulic system with two independent pumps. In Agroclimber F versions, the main pump has an impressive capacity of 42 l/min, while the main pump in Agroclimber V models is available with delivery rates up to 42 l/min. 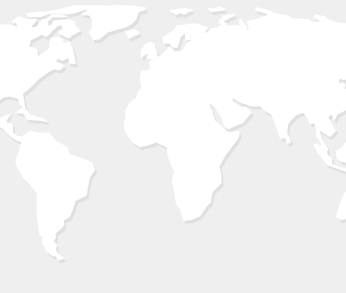 In both cases, the main pump feeds four auxiliary distributors as well as all the most important components on the machine. 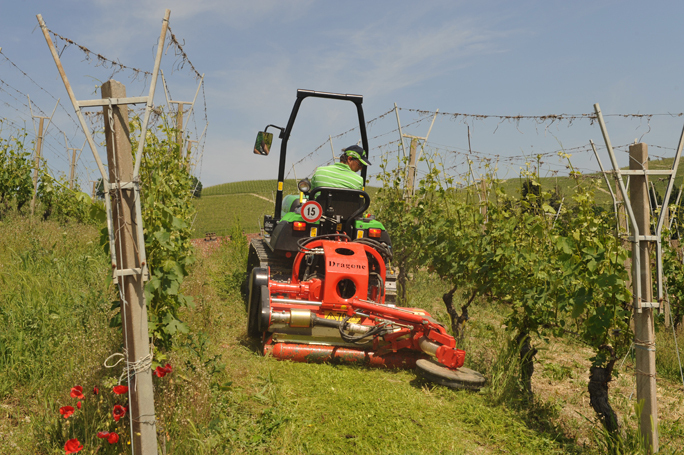 A second pump mounted on the engine (with a capacity of 25 l/min for Agroclimber F models and 18 l/min for Agroclimber V models) has a capacity of 25 l/min, and feeds the steering system and PTO clutches, as well as providing lubricant oil to all the components of the transmission. 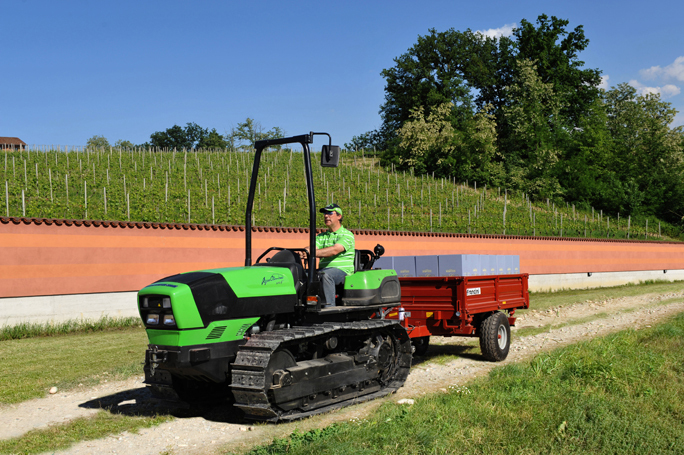 All F and V models are equipped with a rear lift with an entirely mechanical hitching system and a load capacity of up to 3000 kg. The position, draft and mixed mode functions of the rear 3-point linkage are controlled from ergonomic controls on the lift itself. Constructed for the toughest conditions. 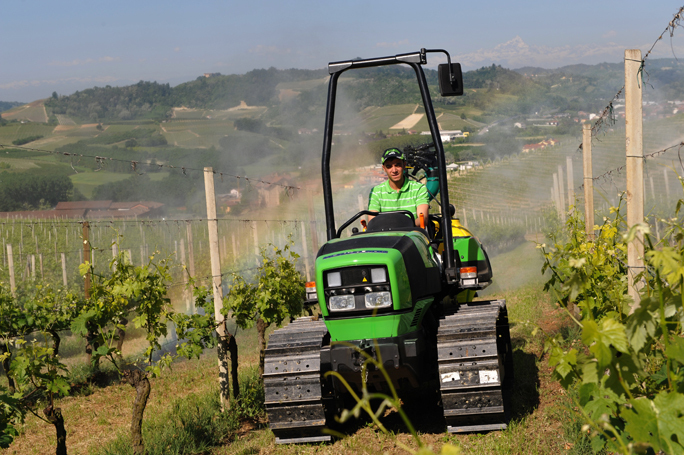 As well as offering state of the art technology, DEUTZ-FAHR crawlers are also built with safety first and foremost. The Agroclimber F and Agroclimber V are conceived for challenging conditions, with every component engineered to tackle the most complex job and the toughest terrain with absolute reliability. The steering clutches and brakes for each crawler track are controllable independently using pedals or a pair of levers on the instrument panel, for simple, precise manoeuvring. The track chains run on four flanged bottom rollers designed and built to withstand high axial loads. The ring gear profile is specifically designed to ensure uniform track chain wear, for extended durability of the tracks themselves. Chain tension is adjusted manually. The spoke configuration of the sprockets prevents the build-up of mud and soil, protecting the track chains against damage. Vibration-free and quiet for total comfort. 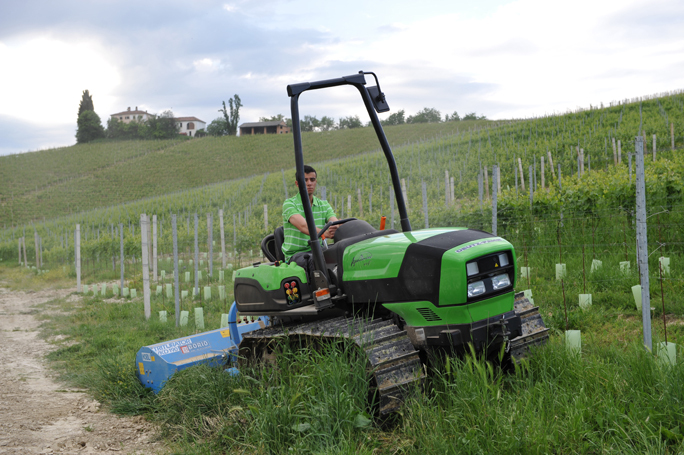 The platform is mounted on four silent-blocks, which insulate it against vibrations produced by the tractor. In essence, silent blocks are a patented type of rubber mount that eliminate the typical noise produced by fixed mounts, which can be unpleasantly loud and constitute a serious distraction, making work significantly more difficult for the driver. Getting into and out of the driver seat is made safety and easier by the flat floor of the platform. The instrument cluster provides clear, comprehensive information on the status of the tractor: with engine speed, speed in Km/h, PTO speed, hour meter, fuel gauge and coolant temperature. 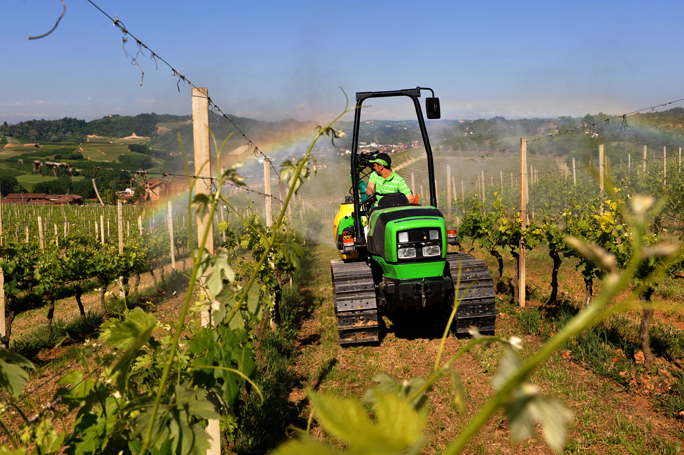 While every aspect of Agroclimber F and V crawlers is optimised for compactness, these machines still deliver extraordinary functionality and comfort. 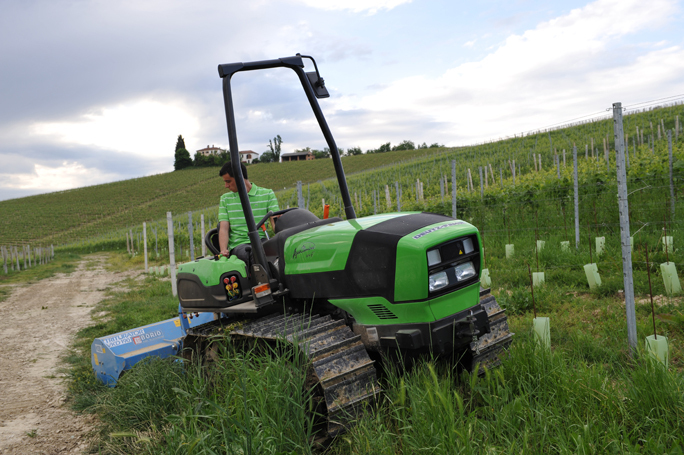 Agroclimber crawlers are available in four different configurations (two for F versions), with different overall widths, platform sizes, wheelbases and track widths to cater for different needs. 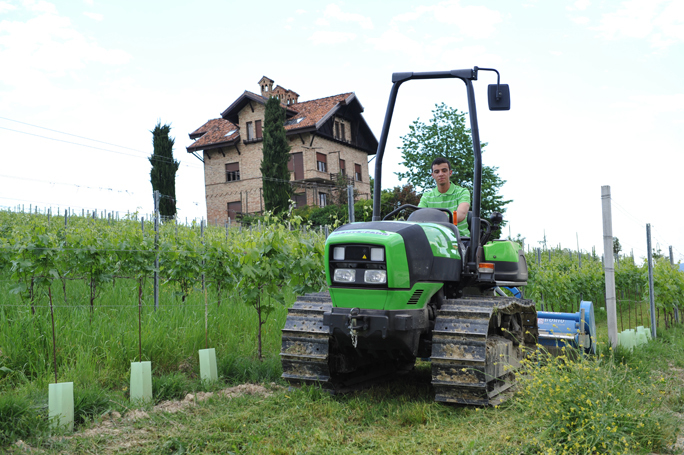 Agroclimber V: overall width 1.18 m; wheelbase 1.41 m; platform 56 cm; track footprint width 28 cm. 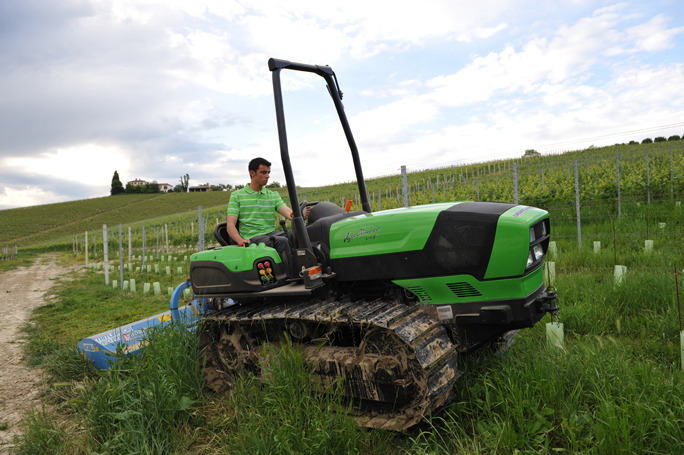 Agroclimber V: overall width 1.27 m; wheelbase 1.43 m; platform 56 cm; track footprint width 31 cm. 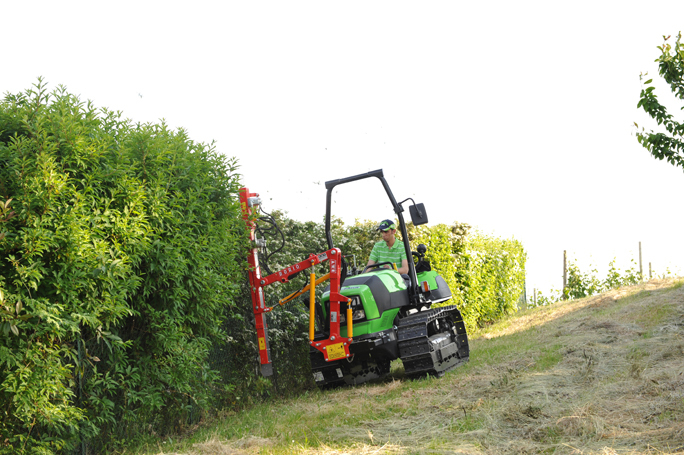 Agroclimber F: overall width 1.46 m; wheelbase 1.65 m; platform 68 cm; track footprint width 36 cm. 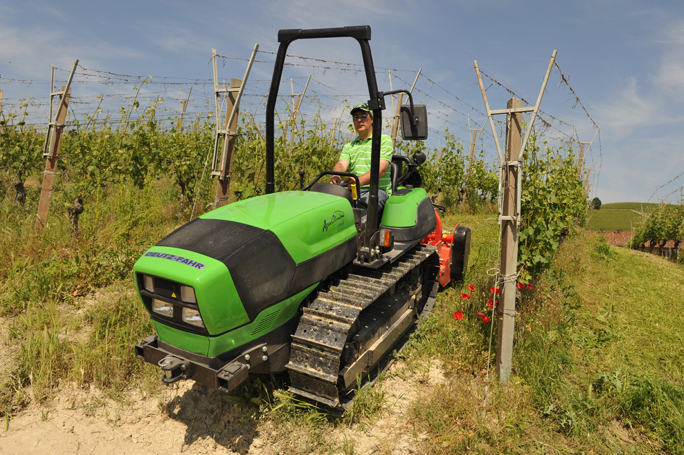 Agroclimber V: overall width 1.6 m; wheelbase 1.57 m; platform 70 cm; track footprint width 36 cm.